A car plowed into a discount store on Ninth Street and Fifth Avenue at about 5:24 p.m., the FDNY said. PARK SLOPE — The driver who injured four people when he jumped the curb and crashed into a store Monday had his license suspended twice before and was illegally using his vehicle to pick up passengers, according to authorities. 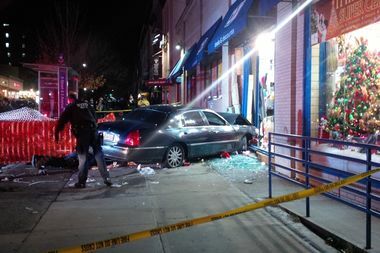 Alberto Montana, 61, was arrested and charged with driving with a suspended license after he drove his 2006 Lincoln town car onto the sidewalk at Ninth Street and Fifth Avenue and smashed into a Deals & Discounts store at 5:24 p.m., according to a criminal complaint. Montana's attorney at Brooklyn Defender Service could not be reached immediately for comment Friday. Montana who was in a car with New Jersey plates had a passenger in the car at the time of the crash but he didn't have a license to do so, according to the complaint. Taxi & Limousine Commission records show Montana has never been a TLC license holder, a TLC spokeswoman said. Montana had his driver's license suspended twice, according to the criminal complaint, including once after failing to appear in court following a traffic summons. No one was injured inside the store, but four people on the sidewalk suffered serious injuries, according to the FDNY. Montana crashed on a busy corner near a B61 bus stop. "Everybody was shocked and scared because half an hour [before] there were people working in that area,” one of the store’s managers said. “Thank God nobody was there."